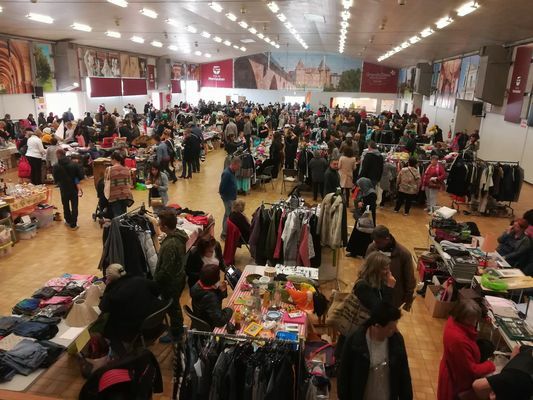 The association Quartier 13 organizes this Sunday, April 14 from 8:00 to 18:00 in the village hall of the market station (Montauban), a garage sale to the benefit of the league against cancer Tarn and Garonne. It's now been 6 years since the association Quartier 13 decided to organize every year an event where all the profits are donated to the cancer league 82. Each year it is donated an average of € 1000, and we hope always do better. We expect you many this Sunday to come to search the alleys and quench your thirst at the refreshment bar where a restaurant will be waiting for you. There are still some places to register soon with Marie line, you will make a gesture of solidarity for the sick and you will empty your closets. Info at 06.20.35.24.59 or on our Facebook page "Quartier 13"